Summer Challenge | OhmConnect - Claim Your Spot Today! Earn more than $400 with our Summer Challenge! The Summer Challenge is a new program that puts you in control of saving energy in your home. Start by choosing how often and how much you want to save, and we’ll tell you what you can earn over the summer. Then, if you’re successful at the end you’ll get paid! Choose how often and how much energy you want to reduce over the whole summer. Once the Summer Challenge starts, we’ll tell you when it’s time to power down your home every few weeks. If you beat your goal at the end of the summer, you’ll get paid in full! Every few weeks during the summer, we’ll tell you when it’s time to power down your home. You’ll get just the number events that you select at the beginning of the summer — no more, no less. This means lights off, electronics unplugged, waiting to run your dishwasher, or maybe even flipping your circuit breaker if you’re really feeling ambitious. If you hit your Summer Challenge goal by the end of the summer, you’ll get paid in full. Your goal is measured against the average reductions over all events during the summer. We’re currently assessing interest in this program and expect to fully launch the Summer Challenge on June 1st, 2019. Secure your spot today, as enrollment will be limited. Your summer potential payout is based on your home's current energy use, how many events you select, and how much you choose to reduce. While we continue to gauge interest, you’ll continue to receive regular #OhmHours until the summer starts. Before the Summer Challenge kicks off officially, you’ll be able to adjust your commitments. 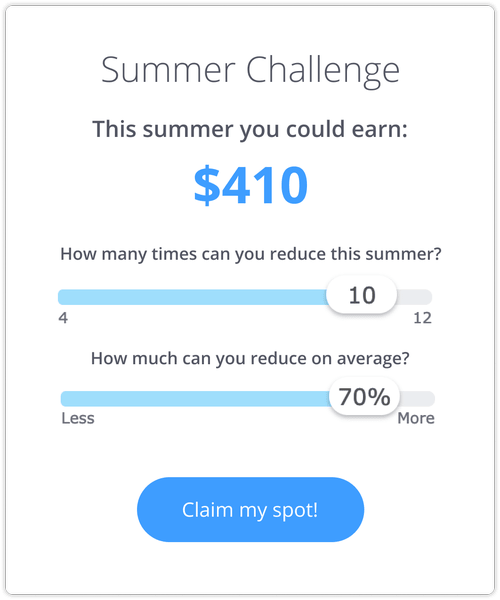 You need to have connected to your utility info to your OhmConnect account to see how much you can earn with the Summer Challenge. Need help? Q. What is OhmConnect again? A. OhmConnect pays you to use less energy in your home during peak times, when the electricity grid is stressed. You connect your utility account to our platform, so we can see how much energy you’re using. Then we give you a goal to try to use less during specific hours, about once a week during the hot summer months, and less often during the rest of the year. If you’re successful and use less energy than normal, we pay you! Q: What’s the Summer Challenge all about? A: It’s simple: You choose how much energy you think you can reduce and how often you’d like to do so before the summer starts, and we’ll promise a hefty reward (like $400!) if you’re successful at hitting your goals. We'll send you an SMS or email to tell you when it's time to power down every few weeks. Then, at the end of the summer, we'll pay you if you hit your goal. The only catch is this: if you’re not successful at hitting your energy saving goals, you won’t earn anything at the end of the summer. Q: Why would I get paid to save energy? A: When the grid is stressed, either one of two things can happen. 1) Dirty and inefficient ‘peaker’ power plants can turn on or 2) people can save energy. A growing number of states and municipalities would prefer to pay people for saving energy because it’s cheaper, cleaner, and puts money back in the pockets of community members. Q: How does OhmConnect get the money to pay its users? A: The energy markets and utility companies would rather pay us for promising that people will NOT use energy during peak times, than pay to turn on those dirty peaker power plants when demand is high. We just pass that savings from them to you! Interested in more of the details? Check out this article here. Q: I’m familiar with OhmConnect. How is the Summer Challenge different from regular #OhmHours? A: During regular #OhmHours, users are paid a certain number of points based on the amount of energy they save during that particular hour. There is no need to commit to reducing a certain percentage -- as long as your energy usage is less than what you’re forecasted to use (what we refer to as your ‘energy baseline’) you will receive some amount of points. With the Summer Challenge, the stakes are much higher — and so are the rewards! The amount of money you can earn with the program is significantly higher than with regular #OhmHours but the commitment is also a bit riskier. By committing to reducing during a set number of hours over the summer, OhmConnect is relying on your reductions and is in turn, committing these reductions to the State of California. For this reason, the program is ‘all or nothing’ — meaning that you’ll only earn your payout if you’re successful at the end of the summer and have used less energy than your original goal. Q: Does it cost money to participate? A: Nope! OhmConnect and The Summer Challenge is completely free. Q. Can I be in both the Summer Challenge and regular #OhmHours? A. No - the Summer Challenge takes the place of regular #OhmHours. Participants in the Summer Challenge will ONLY receive notifications about the handful of events throughout the summer that require deep energy reductions and will not be included in regular #OhmHours.